Yesterday, I shared about the Chinese Wedding Ceremony in Malaysia that my husband and I personally experienced more two weeks ago. My last discussion on that post was about distributing red pockets (红包) to the younger (unmarried) siblings, cousins and nephews/nieces at the groom's residence after the Tea Ceremony was over. Since we were having a luncheon wedding reception, after the Tea Ceremony was completed, basically we had to rush back to the bridal house because I, the bride, needed to change my dress and do some make-up and hair-do touch ups. 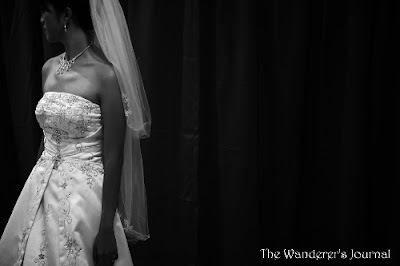 Unlike in Indonesia, in Malaysia usually the bride needs to wear two different dresses for the wedding ceremony and reception, although this is optional. Getting ready for our wedding reception in Malaysia. Meanwhile, after the Tea Ceremony, my husband's best-men went straight to the restaurant to prepare our wedding reception first as they were helping us with setting the stage decoration. Albeit we have booked some artificial flower decorations and red carpet for the function room from a local florist here; we felt that we needed to do something with the 'empty' stage ourselves because it's cheaper and doable. We also had a friend who was responsible to manage the wedding slideshow and background songs (that my husband and I compiled) throughout the event. In addition, one of our friends was tasked to pick our wedding cake up from the cake house to the restaurant (since the cake house here in Seremban does not do any delivery!) Cool, huh? 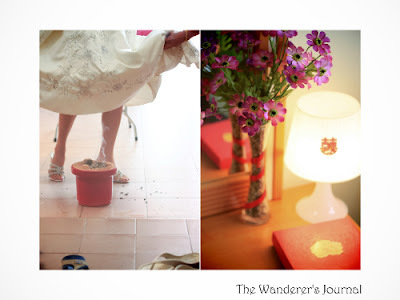 These are few of the examples of the Do-It-Yourself wedding preparation in Malaysia that I once mentioned. When you intend to involve minimum vendors for your wedding preparations, your good friends are indeed your best last resorts. The best-men were working really hard to set up the DIY stage decor. My husband asked for his cousins' assistance to be the guest receptions. About an hour from the wedding reception's starting time as per written in the wedding invitation card, both my husband and I arrived to the restaurant and were ready to enter the function room. We intentionally came there 45 minutes to an hour late because we waited for the function room to be 70%-80% filled with guests first. After the MC (who turned out to be the restaurant's banquet captain) delivered her welcome speech to all the guests; both husband and I entered the function room, led by our flower girls (who thankfully performed their duties extremely well that day!). The bride and groom ready to enter the function room. Our arrival to the function room marked that the wedding reception had just officially started! 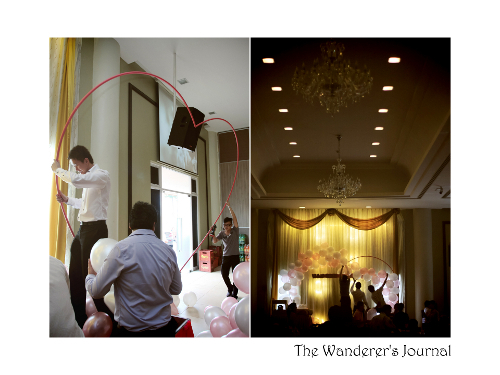 The bride and groom's entrance procession to the function room in Malaysia was really simple and straight to the point. No fanfare and no need to go to the stage first. We both just had to walk behind the flower girls (optional) along the red carpet, threw happy smile to everyone (left and right) then sat directly to our assigned seats at the VIP Table. Next, we all (including the bride and groom) could start eating the first dish, the Chinese Cold Platter. No food parade either. At weddings in Malaysia, apparently the bride and groom have a lot of chances to eat the dishes during the wedding reception. In Indonesia, very likely, both of the bride and groom would go home hungry after the wedding reception because they'd be standing on the stage most of the time and could not eat much. After the fourth dish was served, the MC asked both bride and groom to go to the stage and do the Pyramid Fountain and Cake Cutting Ceremony. Then, the bride and groom could go back to their seats for a while and eat some food again. 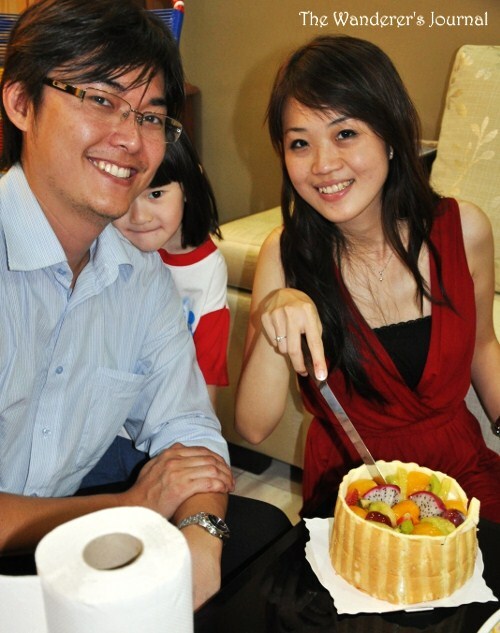 Pyramid Fountain and Cake Cutting Ceremony. 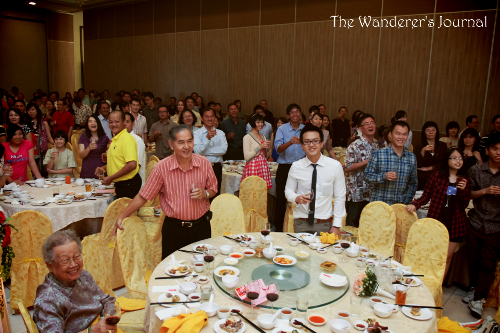 Not long, it was the time for Toasts (Yum Seng) where the bride, groom, respective parents and other guests (close elderly relatives) who occupied the VIP table had to go to the stage. 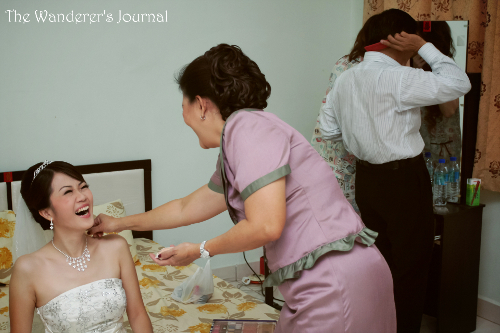 For Chinese weddings in Malaysia, usually the toast (Yum Seng) is done three times. The first one is led by the MC. Everyone stood up, held their glass high and screamed Yuuuuuuuuuuum Seng (as long and loud as possible) when doing this. The second and third toasts usually would be led by the groom himself or a family member. I never thought that my husband would dare to lead the second and third toasts in front of the guests! He even gave an impromptu speech when he did this. I was so surprised! How come he got the guts to do this considering his general reserved nature? My husband was giving an impromptu speech before the second and third toasts. During the toasts, three microphones were given to us. One was for the groom, second one was for the groom's father and the last one was for my Dad. Since we don't practice Yum Seng in Indonesia, when the microphone was passed to my Dad, he got so panicked as he did not know what to say and passed the microphone to my uncle instead. My uncle didn't know what to say either then he gave the microphone to my Mom. My Mom passed it to me. Neither I wanted to hold the microphone during the toasts. In the end, I gave it back to my Dad and asked him to just hold it without saying anything. It was such a scene! kept passing on the microphone to each other during Yum Seng. The guests: During Yum Seng. Post the toasts, it was the time for photo sessions. 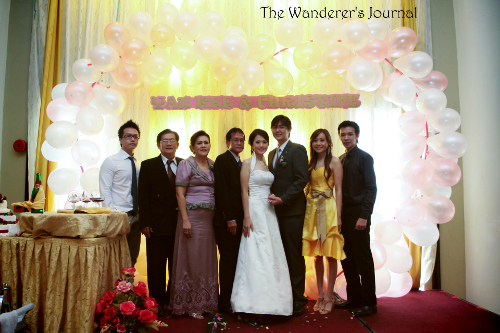 Firstly, the bride and groom took photo with core family members on stage. Portrait with my family from Indonesia. Portrait with my family from Malaysia. Moving forward, the bride and groom had to do some rounds to each table and take photo with the guests, usually only with relatives and close friends. Group photo with my husband's best friends and best-men. next-door neighbors, sister and (future) bro-in-law. About two hours later when the dessert was already served, some guests began to leave the venue. The bride, groom and the parents had to stand by the function's room entrance door to shake hands whilst saying thank you and goodbye with those who were leaving. 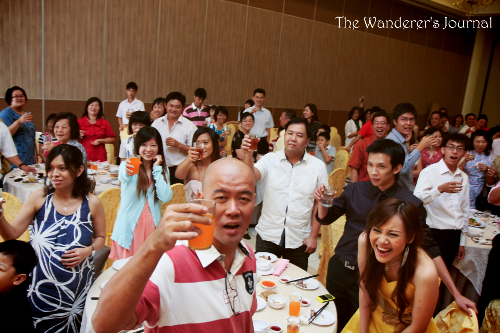 In the meantime, most of the guests could do their own Yum Seng with their friends or whoever people they shared their table with on their own until the wedding reception was over or until all the provided drinks were all gone! With this, our wedding reception in Malaysia was concluded and so were all the wedding hypes for the past one year and a half. 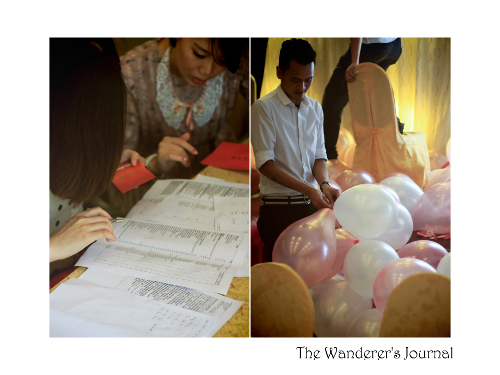 The Wedding in Malaysia: Part 1, Part 2 and Part 3. 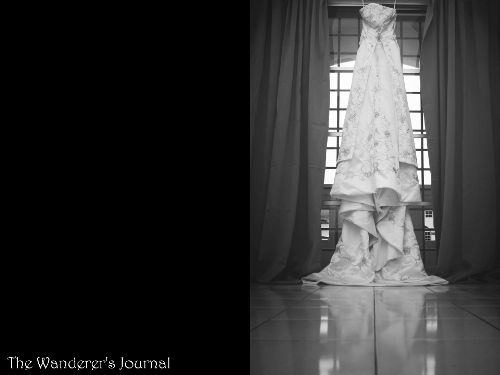 Some personal remarks: I guess blogging about my journey to the wedding day is more than just keeping a journal. I hope my above posts are also beneficial to some of you who seek some insights, built from one's personal experience, on the overall Chinese wedding preparations, ceremonies and receptions usually done in Indonesia and Malaysia. Please note, however, that all the wedding preparations, ceremonies and receptions' details I wrote are attributed to my (and my husband's) personal circumstances and some of them are optional to be practiced. Therefore, some of the shared wedding ceremony sequences or processions may not strictly be applicable to everyone else. On last Sunday morning, my husband finally received our wedding (in Malaysia) photo soft copies from our wedding photographer, ZUST Photography. 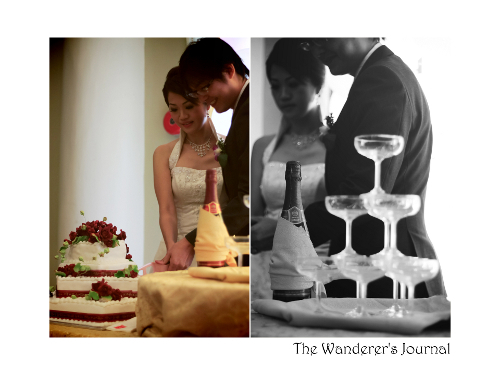 Thanks to ZUST team, now I can continue writing the next recap of my wedding day in Malaysia. 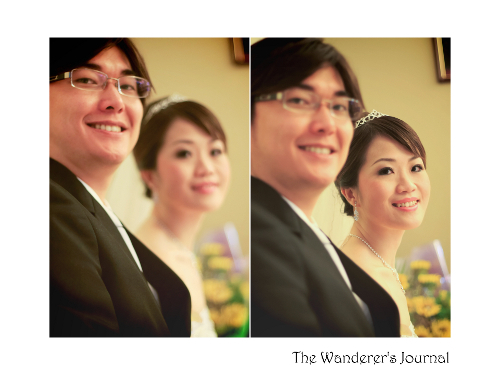 Check the first recap of my wedding day in Malaysia here. The very last part that I previously wrote for the recap of my wedding day in Malaysia was about the door games that my husband and his entourage had to go through when he picked me up at the rented wedding house (which acted as the bride's house). When my bridesmaids were busy throwing all of the challenges to the guys, I was busy dressing up, doing my hair and fixing my make-up. My wedding dress for the morning wedding ceremony. My Mom was helping me touching up the final make-up. The bride was ready: Waiting to be picked up. I was waiting in the room alone for about 30 minutes until the groom completed the whole challenges and picked me up. When the groom finally entered the room where I waited, he opened my veil and we took a little bit of photos with family and friends too during this session. Meanwhile, since the groom's family gave us 9 cans of preserved pork legs (traditionally, a whole of roasted pork would be given) when he picked me up, my parents would have to prepare some dowry gifts that they had to present back to the groom's family. I can't exactly remember what was given to the groom's family then. All I could recall now; as part of the hamper, there were several types of cookies and two bottles of orange juice given to them. The dowry gifts for the groom's family. Next, we all went downstairs and were ready to make a move to the groom's house for tea ceremony with his family. On my way to ascend the wedding car, my Dad held a red umbrella over my head outside the house *good for UV protection too*. Symbolically, in Chinese wedding traditions, this red umbrella would protect the bride from evil spirits. 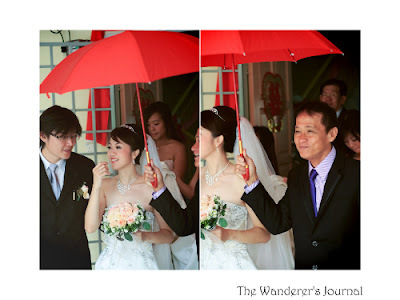 My Dad was protecting the bride by holding a red umbrella above her head. Few minutes of driving later, we arrived at the groom's house where his family has waited. I think we were just in time in arriving at the groom's house, just as per the advice of the 'Smart Person' in the temple who chose our wedding date. All of our friends and bride's family also followed us to the groom's house. Apparently, all of the best-men' cars that came to the bride's house had to be filled fully with people when they went back to the groom's house. Hence, we split some bridesmaids and bride's family members to join all the best-men's cars to fill all the empty space. The first thing we had to do before we entered the house was to pray (拜拜) to heaven and earth. There was an offering table prepared in front of his house's entrance door and we had to pray before them. However, since I am a Christian, I didn't really follow my husband when he prayed. I was just physically accompanying him during all the prayers. I was holding my flower bouquet instead of joss sticks. By the way, since my family from Indonesia also followed us to the groom's house, they had to wait inside the car first after the bride and groom finished praying. Only then, they all could come inside the house and witness the rests of the wedding ceremony as well. Praying to Heaven and Earth. Another ritual after the prayers before going inside the house was stepping over the lit stove. Yes, the bride had to lift her long dress a little bit and step over the lit stove as it is believed to throw the evil influences out. The bride's stepping the lit stove over. Once we went inside the groom's house, it's not the tea ceremony time just yet. 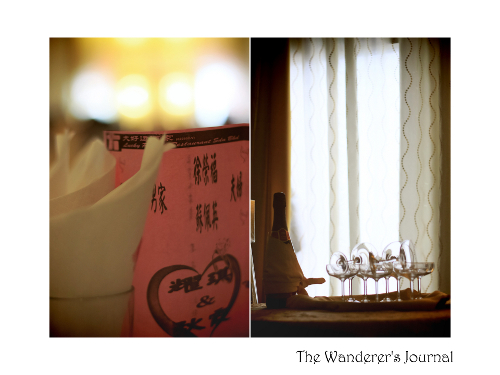 Both groom and bride, together with some friends and groom's family members, had to go straight to the bridal room and feed each other with red and white Tang Yuan or glutinous rice balls as a symbol of good luck and happy life together. 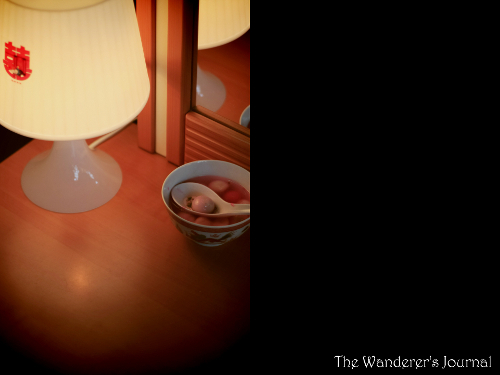 Notice that we turned on a pair of lamps in the bridal room even during the day. A bowl of Tang Yuan or glutinous rice balls for Chinese Wedding customs. Then came the scariest part, we were supposed to invite a bunch of little children to jump, roll or do whatever they wanted on the bridal bed (no peeing or salivating, please), which was just covered with a brand new linen. I was totally not in the loop for this arrangement and kind of shocked when my husband and his brothers invited our nephews and nieces to jump on our bed after we ate the Tang Yuan. It was not easy to ask them to stop jumping after we purposely asked them to do it in the first place. I think we had to drag one kid out of the bed too. People say, little children invited to jump on the bridal bed are to bless the couple with fertility. Honestly, I was the first one to tell them that they have jumped on the bed enough and could leave the bed immediately. But my words quickly evaporated in the air. Kids...! Kids happily jumping on our bed. I almost cried. Once we were done with all the customs we needed to do in the bridal room (plus took some photos again), we went downstairs and started the Tea Ceremony (敬茶) with the groom's elderly family members. 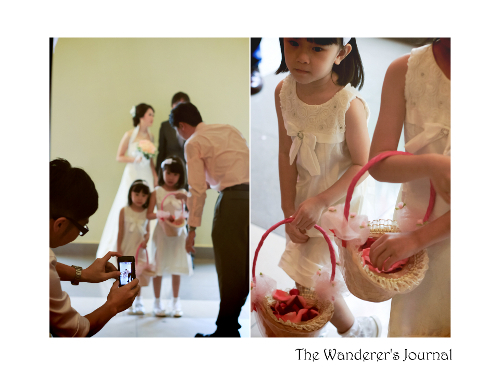 This custom is actually similar to what we did in Indonesia during 敬酒 where the bride and groom served the tea to grandparents, parents, elder (married) siblings, uncles and aunts and married cousins to pay respect and give formal family introduction. Some differences here are: (1) Both bride and groom had to shout the formal titles of the family members quite loudly as part of the official introduction in the family during the Tea Ceremony. 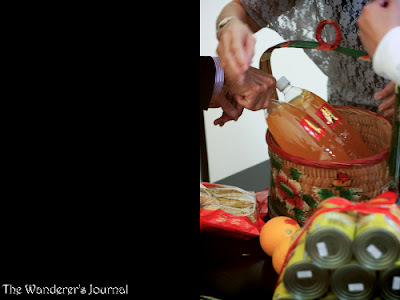 (2) In Malaysia, we used the real Chinese Tea for the Tea Ceremony, not red fanta or grape juice as in the one we commonly practice in Indonesia. 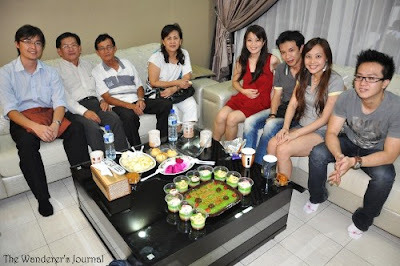 (3) In Malaysia, before the wedding reception, we did the wedding Tea Ceremony at the groom's house. In Indonesia, we usually do it at the hotel or restaurant for the wedding reception before the wedding reception starts. 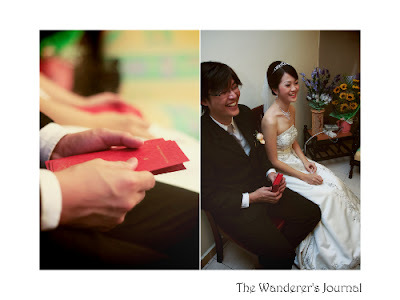 One thing in common here is that during the wedding tea ceremony in Malaysia, the newlyweds still received the red packet (红包) stuffed with money or jewelry from the family members. 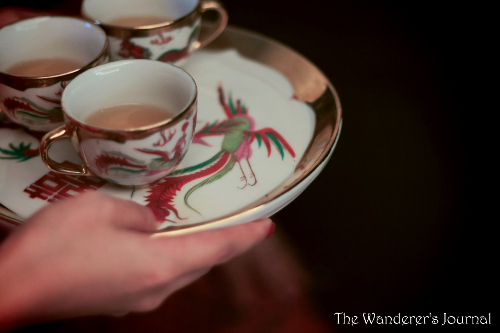 The Chinese Tea for Wedding Tea Ceremony. 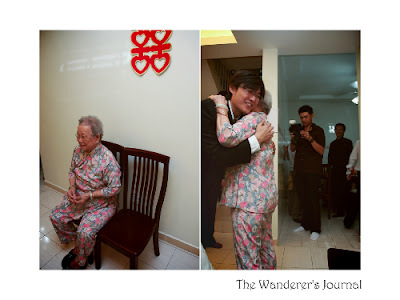 Paying respect to elderly family members during Chinese Wedding Tea Ceremony. My husband and I during the Tea Ceremony. In addition, here's another thing that we don't practice in wedding tea ceremony in Indonesia: Giving red pockets (红包) to all the younger (unmarried) siblings, cousins and nephews/nieces. I remember we had to pack close to 100 red pockets for our wedding day. Usually, in Indonesia, the bride and groom only give red pockets (红包) to some cousins who help the newlyweds out during the wedding reception, i.e. becoming the guest receptionists, ushers, etc. younger (unmarried) family members during the Tea Ceremony. So that's all about the Chinese Wedding Ceremony in Malaysia. After we completed all the customs for the wedding ceremony, my husband sent me to the bridal house so I could change the wedding gown and do some make-up and hair-do touch ups for the lunch wedding reception. 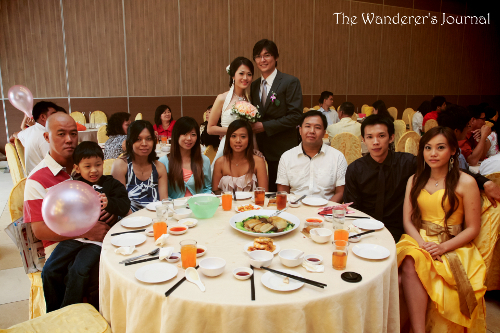 Chinese wedding traditions in Malaysia are quite complex and rich in culture, don't you think? Especially, if we really follow every bit of them. 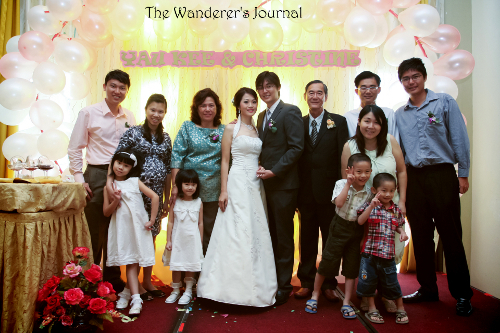 We were really fortunate to be assisted by one of my husband's aunts from Singapore who understands most of the Chinese wedding customs and led us during our wedding ceremony both at the rented wedding house (bride's house) and the groom's house. 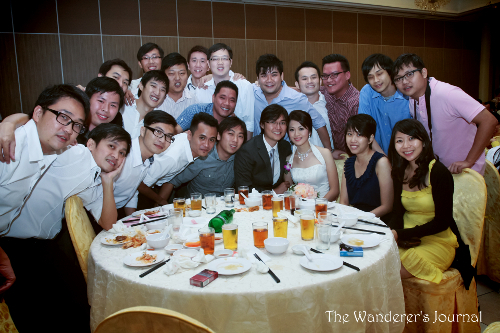 Wedding Reception in Malaysia - To be continued. This is a really belated post. 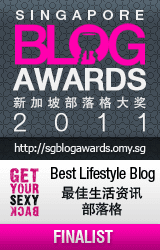 I finally got the mood to blog again after some two weeks of blogging hiatus. Plus, I just got the below photo soft copies from my brother-in-law only on last weekend. Earlier this month, I was slightly complaining of my vanilla plain 27th birthday celebration. However, it turned out not that bad at all. 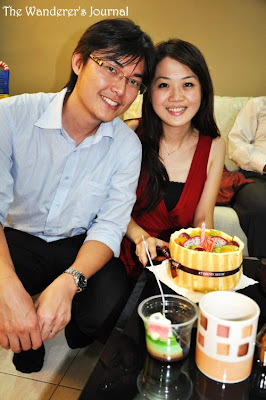 When my family from Indonesia arrived to Kuala Lumpur two days after my birthday, (after various hints from me) my husband bought a birthday cake for me from RT Pastry House in Kuala Lumpur. On top of that, when my family from Indonesia landed to LCCT Airport on Friday afternoon, my sister surprised me with a heavy carton box containing a set of home-made green (my favorite color!) birthday puddings she brought all the way from our hometown in Malang, Indonesia. She told me she spent five hours making my birthday puddings and had to open the (tightly wrapped) pudding box to get through the Malaysia Custom at LCCT Airport. My birthday cake from husband. My home-made lychee birthday puddings. I love the green color here. Aren't they cute? For more info, contact here. I was a happy girl that day but felt kind of embarrassed and awkward blowing the birthday candle in front of the whole family and hoped I could have disappeared from planet earth for few good moments when everybody was singing a birthday song to me. I was truly honored and grateful for the opportunity to celebrate my birthday with my whole family but it's been literally ages since I became the center of attention on birthdays. I was simply nervous. Me and my family from Indonesia: About to celebrate my 27th birthday. Too nervous: Forgot my wish when I blew the birthday candle. My birthday cake, dear husband and me. So, I had the birthday cake, blew the birthday candle and symbolically took a photo of cutting my birthday cake. We did everything we needed for a simple birthday celebration and everything was perfect. The only sad thing was that we didn't get to eat the birthday cake. Everyone was about to go for dinner that night and thought of eating the cake sometime later. We forgot eating my birthday cake in the fridge even after my wedding reception on Sunday was over. Thus, at the end of the day, we had a 6-inch birthday cake and 6kg of edible wedding cake to finish. My Mom-in-Law decided to give my birthday cake away to a relative, without our consent, because there were too much cakes at home. I was a little bit upset about the fate of my birthday cake that went to someone else but after thinking about it again, it's no big deal - we could not finish everything anyway. Also, we eventually didn't waste the cake, which was a good thing. I ate one cup of hello-kitty pudding that my sister made and the rest of the puddings went to all the guests who came to our house for mini BBQ party on the following night. The pudding was too cute and it broke my heart when I had to crush the pudding's hello-kitty shape when I was eating it. This is the problem with eating some cute and pretty foodstuff; you got no heart to ruin the cute/pretty shape. By the way, for those of you who reside in Indonesia; do check out my sister's creative clay art portfolio (made by order). If you are interested in having some personally-tailored clay arts for yourself or for gifts to your loved ones, please LIKE her shop's Facebook page and you can start inquiring there! If you are a reader who happens to live in Malang or Surabaya, Indonesia, you can also order delicious, cute and fresh home-made puddings from her. Go add her on Facebook now! Few weeks prior to our wedding day in Malaysia, my husband was approached by one of the staff of a local newspaper here, 南洋商报 (Nanyang Xiangbao). The woman who contacted my husband mentioned that she got his contact numbers from the restaurant that we engaged for our wedding reception venue. She contacted my husband because she understood that my husband and I were going to have our wedding reception sometime this month and offered us to join the 6th (half-yearly) wedding photo contest called "最浪漫新人" or "The Most Romantic New Couple" that her company is currently organizing. Long time ago, my husband and I noticed this contest advertisement from our Bridal House but we both were not so keen in participating since this contest involves purchasing and distributing the newspaper copies at our wedding reception. Honestly, until now I'm not quite too sure about this contest as yet. However, when my husband mentioned all the potential prizes that we could win, I mean if we ever get in to the top 20 or something, I told him to give this contest a green light. No harm trying. After we confirmed our participation, we were asked to submit a pre-wedding photo to the 南洋商报's office in Seremban and paid about RM 200 for the newspaper copies (featuring our pre-wedding photo) that were about to be distributed to our guests at the wedding reception. I am not too sure if this contest requires public voting or not since we were made to distribute the newspaper copies to our guests on our wedding day. This sounds really, really lame, I know. But, my husband and I joined this contest just for fun (and the prizes too)! 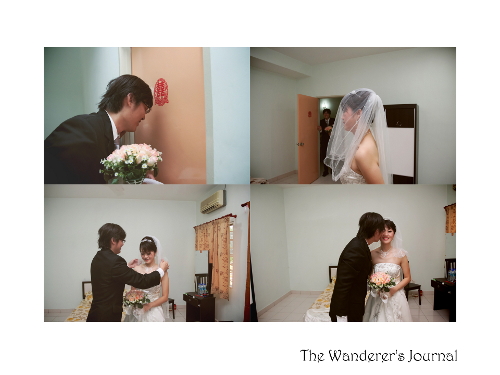 To cut the story short, one of our pre-wedding photos appeared in the local (Negeri Sembilan State) page of 南洋商报 on last Sunday, 11th of September 2011. It was a pretty weird and embarrassing exposure for me but my Dad was pretty surprised and excited with his daughter and son-in-law's wedding photo being featured in the local newspaper. He brought few exemplars (that got our photo in) back to Indonesia. Haha! 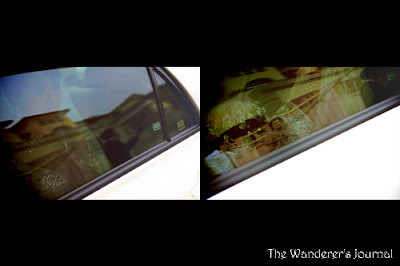 The newlyweds who participated the photo contest and got married on 11th September 2011 (in Negeri Sembilan). Can you spot my husband and I in the above contest ads in the newspaper? I believe for this contest, some of the criteria that the organizer used in selecting the pre-wedding photo winners are namely the photos' backgrounds and styles, photographers' skills, couples' photogenic poses and even their looks. Thus, the prettier the couples, the higher chance for them to take the prizes home. I guess. Anyway, let's watch and see the winner announcement which is due sometime by the end of this year, if I am not mistaken.